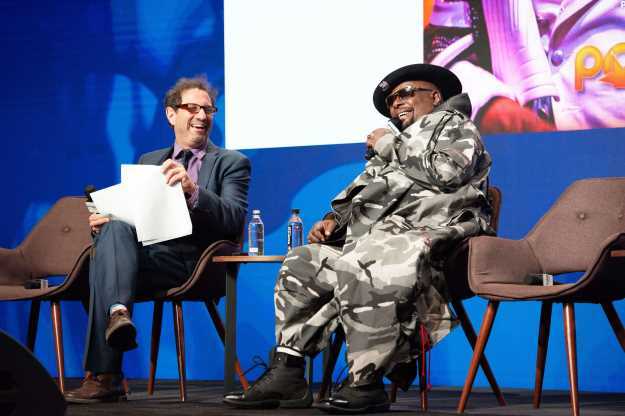 When George Clinton takes the stage - any stage - his goal is to "blow them outta here." And he did just that in his Pollstar Live! interview with Pollstar executive editor Andy Gensler in front of a jammed International Ballroom on Pollstar Live! 's opening day at the Beverly Hilton Hotel. Dressed in a suit of gray camouflage - symbolic of Parliement-Funkadelic's "Anti Tour" in 1978 - Clinton recalled his career as colorfully as only the Prime Minister of Funk could. In a wide-ranging interview, Clinton talked about his time writing songs at the Brill Building - the writing home of Carole King and Gerry Goffin but also of a stable of writers for Berry Gordy's Jobete publishing company, the foundation of Motown, his transition to funk, rock 'n' roll and how his Mothership made it to the Smithsonian Institution. The roots are interesting, but Clinton especially reveled in tales of the evolution of Parliament, an old-school doo-wop group he led, into a merger with his turned-on, tripped-out funk band Funkadelic - aided with the help of psychedelics and other accoutrements of the 1960s and '70s. "Motown had the Funk Brothers and all that, and were the funkiest around," Clinton said. "We did it our own way. We were going to do it funkier. When all the English brothers were doing blues, we decided to do that nasty music. We did the funky music that tells stories and some of them were kind of X- rated. We were Parliament, then there was Funkadelic. It gave us an excuse to put the diapers on." Clinton told a universal truth: if you have a hit record, you can do what you want. And when Clinton signed with Diversified Management - the home of Iggy Pop, MC5 and other emerging Detroit mainstays, things changed. "We had a hit record in 1967, a little late for doo-wop groups. We had to switch out of our suits like the Temptations. We were with this agent who kept booking us with this guy, Iggy, who was funky as hell. We got the diapers and went crazy. "It was everything other than what previously had been. We took a tab of sunshine and went crazy. By that time, the Harlem kids were testing acid with Timothy Leary and we were perfect subjects for test. ... It changed our trajectory and we still ain't over it." Gensler took Clinton through some of his greatest stories from his recent memoir, including driving around a detour near Pittsburgh only to find out the hard way it was the set for "Night of the Living Dead," taking an acid-fueled naked romp through Harvard Square in Boston, and how he and his extended family dealt with $1.2 million in counterfeit money through the family barber shop in Plainfield, N.J.
Clinton is on his last tour with P-Funk, but he is not retiring. He said he will continue touring, producing, writing and doing other projects. Within a week after the announcement the Recording Academy would recognize him for lifetime achievement, Clinton was asked what he would miss about touring. "All of it," he said.